The mild steel compact console, MPG, in a IP 55/56 protection degree is available off the shelf. 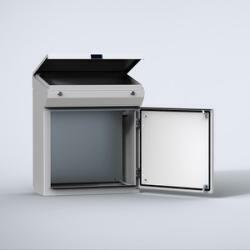 It has a hinged desk panel, and the ergonomic design allows for easy installation and access to HMI-equipment. It also increases the mounting space available. Stainless steel top panels may be used as an alternative when the console is exposed chemical agents, etc. Body and door: 1.5 mm mild steel. Rear panel. 1.5 mm mild steel. Bottom plates: 1.2 mm galvanized steel. Mounting plate: 2.5 mm galvanized steel. Single folded surface mounted with hinges, allowing left and right-hand opening to base door. Angle 12° from horizontal. Concealed hinges on top edge allow 90° opening. Panel held open by self engage/self release mechanical panel stay. Double door on 1200 and 1600 mm wide base units. Bottom opening for cable access. Bottom plates for cable glanding supplied as standard.